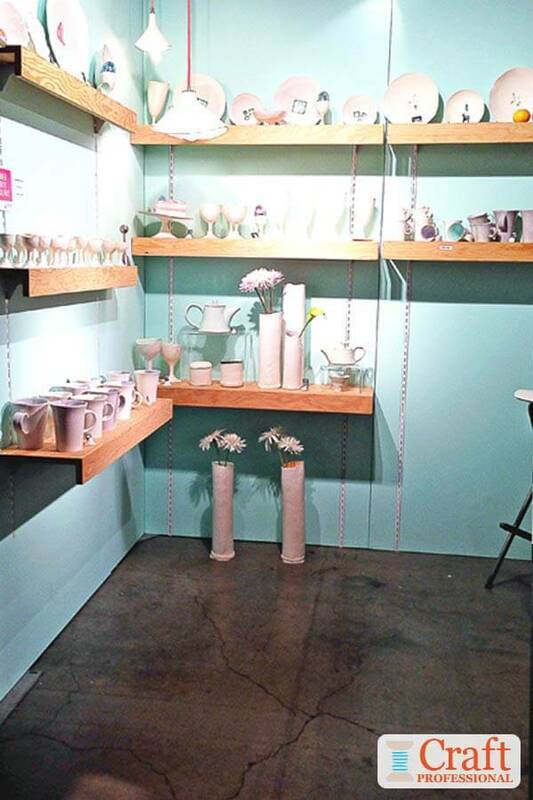 Check out these 6 photos of pottery on display in 3 booths. 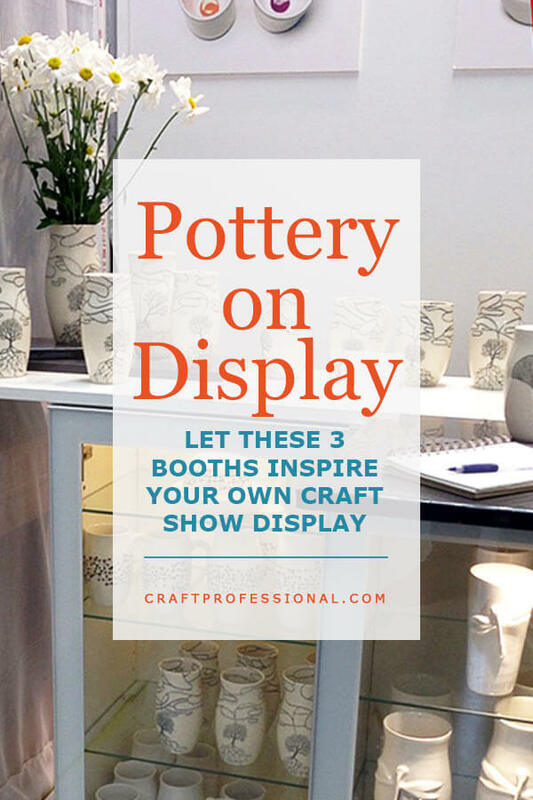 The photos feature booths at both indoor and outdoor craft shows, and countertop displays as well as shelves. 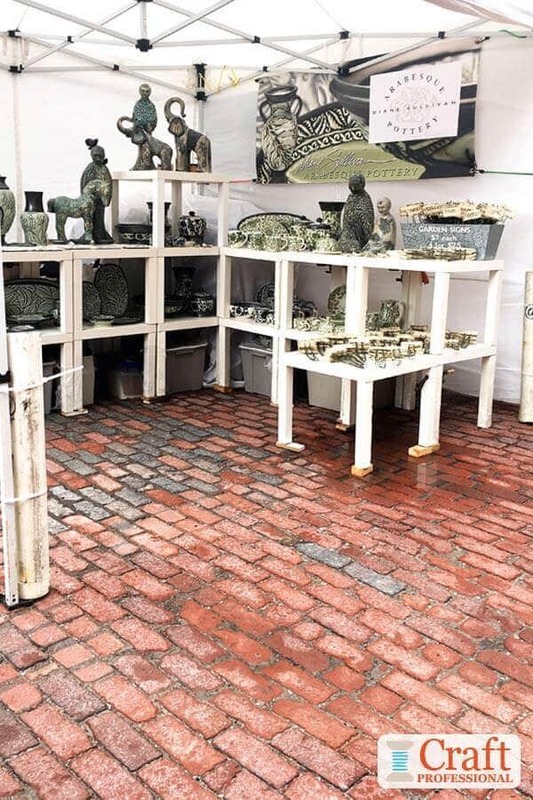 This first two photos (below) showcase pottery on display at an outdoor craft show. It's a simple and clever display made from several side tables. The tables appear to me to be Lack sides tables from IKEA. If that's the case, they can be purchased for under $10 each, making this a very affordable display. The tables aren't too deep. If they are, as I suspect, Lack side tables, they are just under 22 inches square, making them wide enough to safely display the pottery, but not so wide that they take up too much room in the booth. 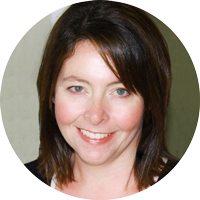 Stacking the side tables is a smart way to add height to the display. Two Lack side tables stacked are almost 36 inches high, making them perfect counter height for browsing. Under the bottom tables are buckets that blend in and match the color scheme of the booth, and are perfect for storage and transportation. Notice there are shims under a few of the table legs. 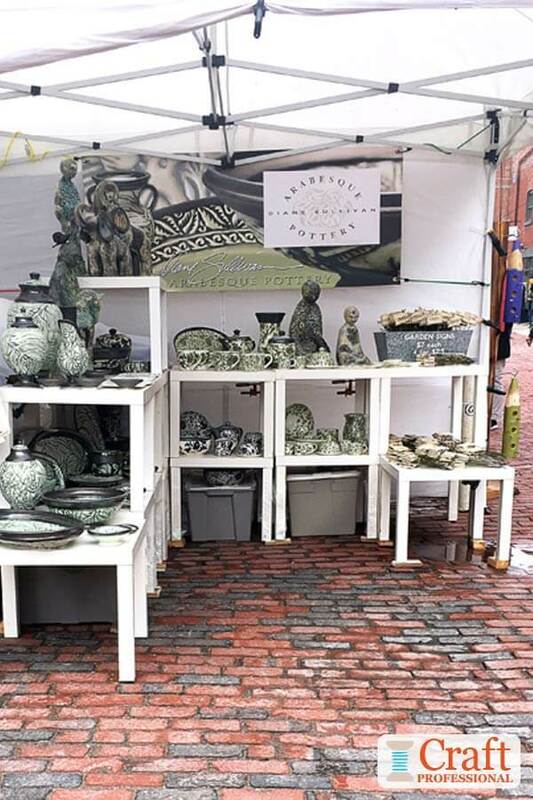 As you can see in the photos, this craft show took place on slightly uneven cobblestone streets, so it was necessary for vendors to take this fact into account and shim some of their table legs for extra stability. I love the booth sign visible in both photos. It's a perfect size for a craft booth. Next, we have a pottery display on shelves. 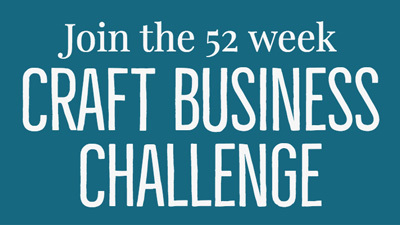 This booth is at a larger, indoor show where craft artists are able to set up more substantial displays than you could at a smaller show. Unexpected color is used well in this display, creating interest and drama. Try to imagine this booth with neutral colored walls. 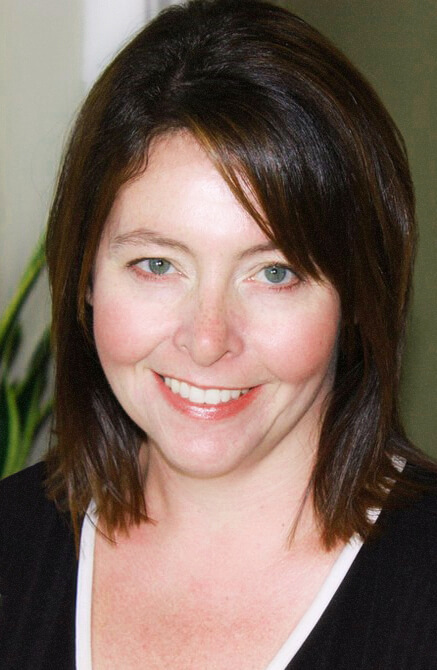 It just wouldn't have the same impact. We sometimes use a splash of color to create a accent wall in our homes, and this display uses vivd red to create an accent wall in the booth. Unfortunately, I didn't manage to get the booth lights in this photo, but you can tell from the photo that there is plenty of overhead lighting in this display. 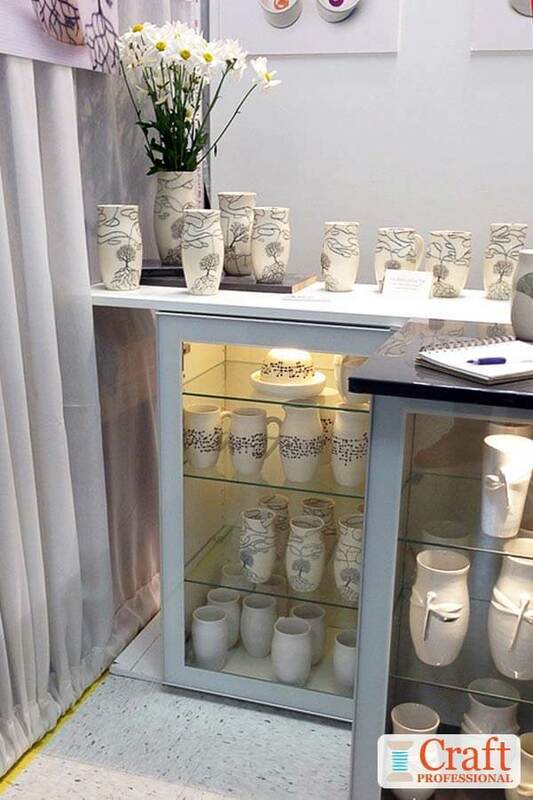 Here's an all white booth with little pops of color that add interest. I'm not 100 percent certain, but I believe the counters are kitchen cabinet with kitchen countertop material placed across the top. 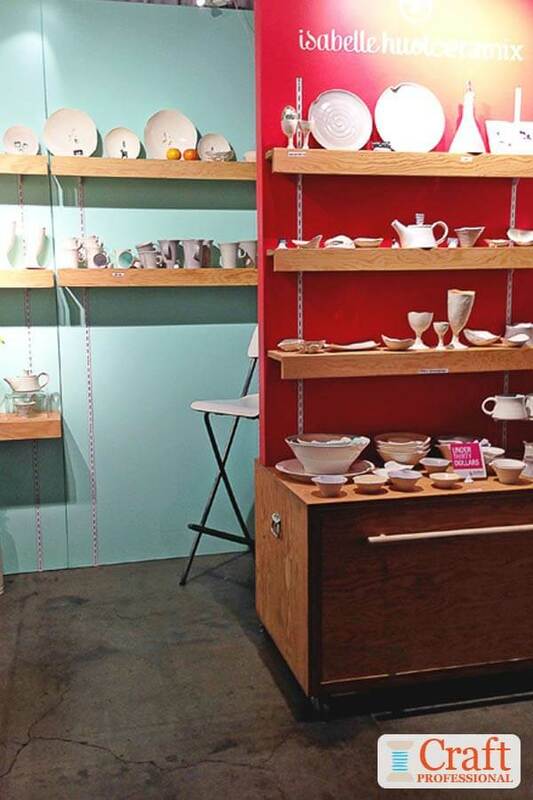 What a clever way to help customers imagine how the pottery would look in their own kitchen. Notice the cabinets are well lit inside. Without lighting, the tableware would not show are well. Also, the shelves in the cabinets are glass, which allows light to flow through. The posters in this booth are fantastic and eye catching. 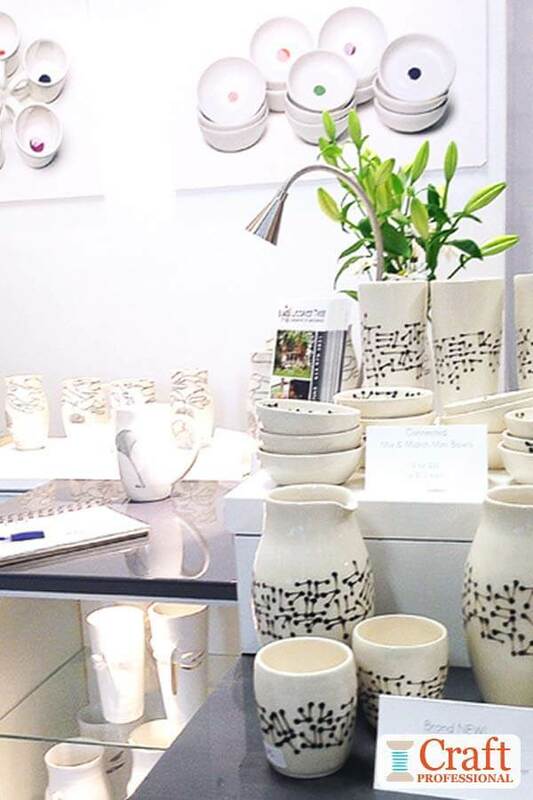 With an all white booth, and primarily white products, it doesn't take a lot of color to draw the eye. I love that this designer chose to highlight these pretty bowls with little pops of color in her posters. They show her understated style well while still being attention grabbing. 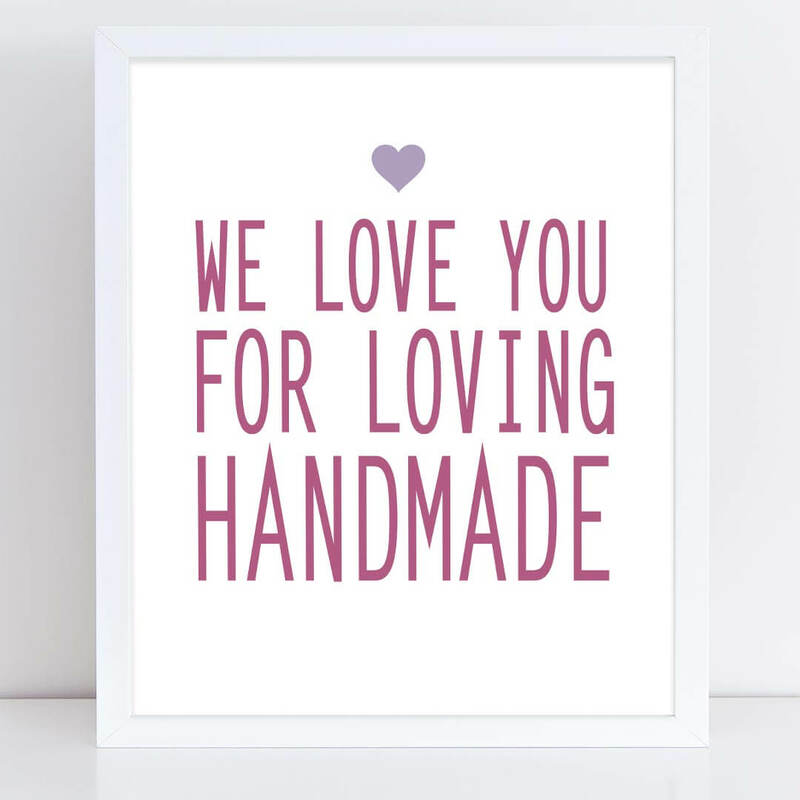 Thank your customers for shopping handmade and supporting small business with my printable craft booth signs. 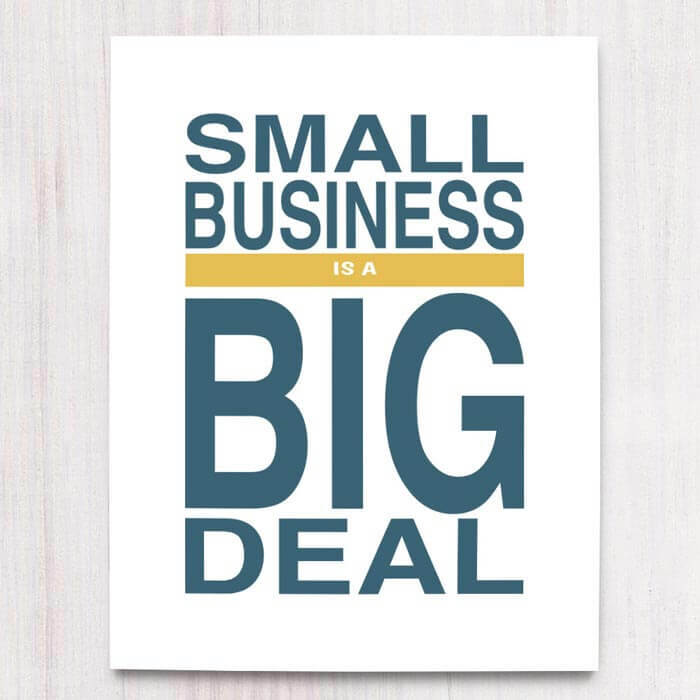 Encourage your customers to support small business. 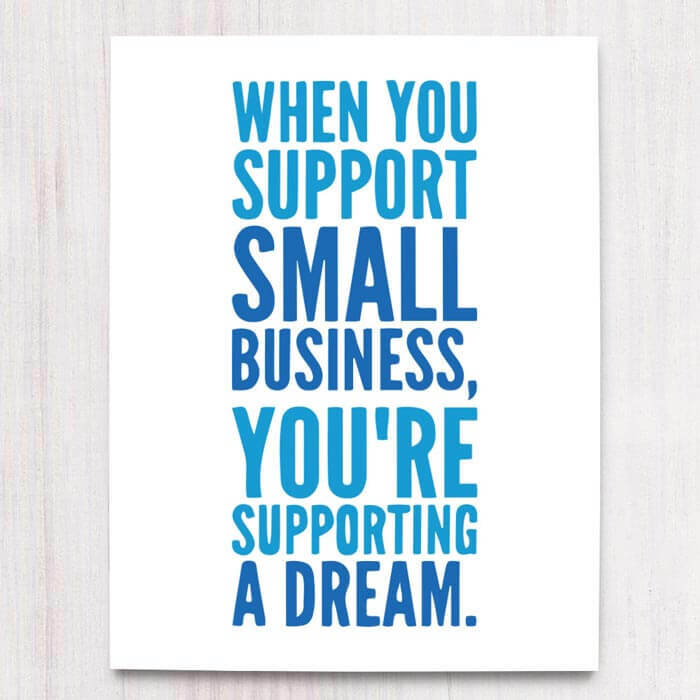 Thank your customers for supporting your dream.